Add some colorful flair to your next event. Our guide feature talented airbrush artists in New York. Browse our list below for entertainers who can produce custom works of art on T-shirts, as well as makeup artists who can create beautiful airbrush tattoos. Check out this great local resource for more airbrush artists in NY. Looking For A Really Good Airbrush Artist in New York? For an excellent airbrush artist in NY, visit Vincent Pagano’s Rainbow Airbrush Company; you won’t be disappointed! He does really wonderful work in a timely manner; many styles, sizes, etc. available. On a budget? Prices start at $3.99. Looking for a professional portrait of your pet - for just $40.00, own an original work of art of your dog, cat, bird, etc. This professional airbrush artist in NY has projects for your club, church, party, sports team, school, whatever you need, he will work with you. Additionally, if you would like a mural or portrait, Pagano’s Rainbow Airbrush can do it for you – no shortage of talent or imagination. Bee-Line Entertainment provides professional air brush artists for a wide variety of parties throughout Staten Island, NY and the surrounding area. Your guests will be amazed as they watch ordinary items transform into awesome, customized party favors right before their eyes! Bee-Line Entertainment can airbrush a wide variety of everyday items including t-shirts, hats, shoes, basketballs, sweatpants and much more! Airbrushed party favors are great for any event, from birthday parties to communions, sweet sixteens, graduation parties or just about any other special occasion. Your guests can bring the item they wish to have airbrushed and the artists work one-on-one with them to completely customize the item. Visit the website to see a gallery of previous work. Call to book now! 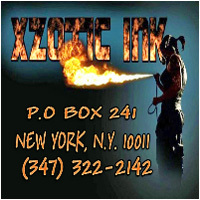 Known by 2 Names: XzoticInk and NYC Airbrush, This is One of the Best Airbrush Artists in New York. Because this is a creative entertainment group of highly talented artists, XzoticInk / NYC Airbrush is one of the best choices to provide entertainment for your special event. These authentic artists can paint anything you request of them, because that is just how fantastically talented they are! Professionalism? Organized? Attention to your requests and details? Yeah, they got that too! They specialize in Bar/Bat Mitzvah’s, birthdays, family/group parties, graduations, holidays… whatever your celebration, they will make it special, memorable, and complete! For the best airbrush artists in New York, you won’t go wrong contacting XzoticInk/NYC Airbrush! 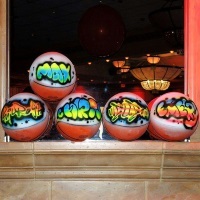 New York Party Artz, one of the best airbrush artists in New York, is perfect entertainment for your special event. If you need onsite custom airbrushing, coupled with gifted/talented, imaginative artists, to help organize your event and make it the best ever, New York Party Artz should be your first choice! They are able to conveniently supply you with favorites such as back packs, ball caps, bandanas, boxer shorts, crew neck sweatshirts, drawstring bags, head bands, knit beanies, long- or short-sleeve tee-shirts, tote bags, mouse pads, pillow cases, tennis sun-visors, tank tops, etc. In addition to familiar/standard airbrush artwork, New York Party Artz can customize artwork for you -- making your celebration even more special. Art Works Studios presents: Airbrushed Events! If you really want to turn your special event into a spectacular celebration, you should contact Airbrushed Events. Experienced and beyond talented, these artists, who are some of the best airbrush artists in New York, can help you assemble a package for either 25, or 2,500 people. Just one of the niceties for your event, is their ability to bring artists to your party, designing customized party favors on location, during the event. Attendees are intrigued during the art process, and will remember the party for years to come. Their expertise allows them to accommodate your event within just five hours of your starting time, up to 200 airbrushed pieces; the selection includes: hooded sweatshirts, beach towels, long sleeve tee shirts, crewneck sweatshirts, shorts, etc. Even more awesome is their talented tattoo artists who attend your event and can apply a temporary tattoo. These airbrushed tats look authentic, are non-toxic, and last five days (even after you shower.) For some of the best airbrush artists in NY, you won't be disappointed with Airbrushed Events. Add new dimensions to your event, with one of the best airbrush artists in New York: NYSKETCHES. Not only do they offer fantastic party favors (hats, tee shirts, hoodies, towels, pillows, boxers, tote bags, et cetera), but their brilliant artists can adorn items with your guest's name & design of your choice in just minutes! Live event paintings, available for your Bar- Bat-Mitzvahs, sweet 16 parties, school events, weddings, or any other celebrations, are always very popular. Being some of the best airbrush artists in New York, NYSKETCHES will have guests talking about your celebration because you and NYSKETCHES captured the memories.